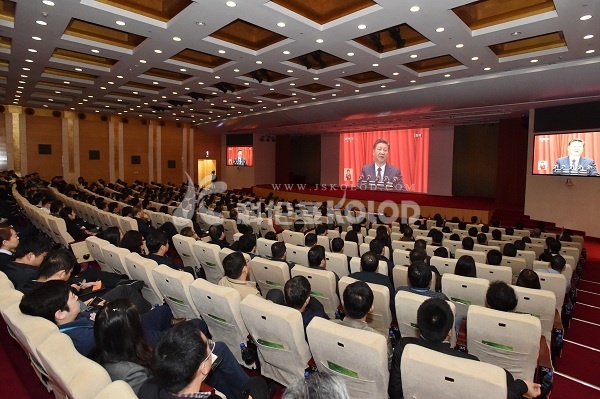 Jiangsu kolod organizes employees to learn the spirit of the conference | Jiangsu Kolod Food Ingredients Co.,Ltd. On the morning of October 18, 2107, the victory of the 19th national congress of the communist party of China (CPC) was held, which was a great event of the whole party and the people of the whole country.Jiangsu kolod much food ingredients co., LTD., organized all party member and company executives, backbone employees, prepare cadres and so on more than 300 people watch the nineteenth big opening, study the 19th report related spirit. County peoples congress on behalf of, the founder, chairman and CEO FengKuanYu said， as xi jinping pointed out, general secretary of socialism with Chinese characteristics into a new era is the development of new historical position in our country, China is in build a well-off society in an all-round way and realize China’s dream of great age.It is of great significance to inspire and mobilize the entire party and the people of all ethnic groups to continue to build a moderately prosperous society in all respects and to adhere to and develop socialism with Chinese characteristics.For our company, we should use this as an opportunity to strengthen our faith, not forget our initial thoughts, and make our products more secure by building innovation in the party.